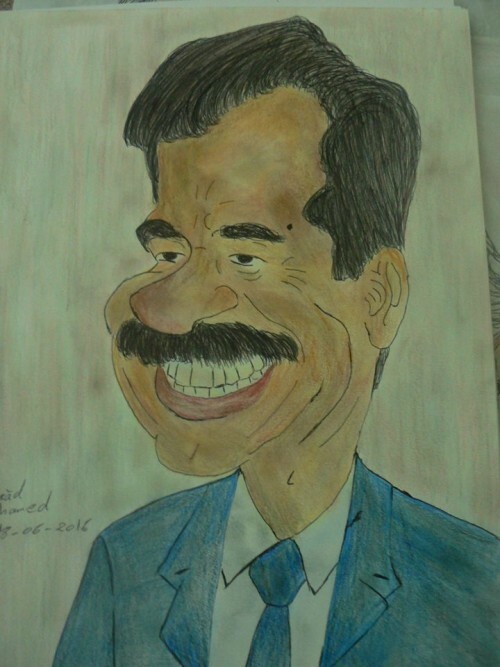 This is a caricature of the president of Irak. Saddam Hussein Abd al-Majid al-Tikriti (Arabic: صدام حسين عبد المجيد التكريتي Ṣaddām Ḥusayn ʿAbd al-Maǧīd al-Tikrītī; 28 April 1937 – 30 December 2006) was the fifth President of Iraq, serving in this capacity from 16 July 1979 until 9 April 2003. A leading member of the revolutionary Arab Socialist Ba'ath Party, and later, the Baghdad-based Ba'ath Party and its regional organization the Iraqi Ba'ath Party—which espoused Ba'athism, a mix of Arab nationalism and socialism—Saddam played a key role in the 1968 coup (later referred to as the 17 July Revolution) that brought the party to power in Iraq.